Piglet has now passed the newborn stage of happily sitting in her bouncer chair or enjoying some snuggles. She is now looking for stimulation, interaction and new things to explore. Wanting something that was going to last longer than a few months I was intrigued to see what the Fisher-Price Convertible 3-in-1 Gym has in store for Piglet. The Fisher-Price Convertible 3-in-1 Gym is a car shaped activity gym that grows with your baby. From those newborn days through to toddler fun-filled days the activity gym converts into three different positions to ensure that the fun doesn’t stop. Assembling the Fisher-Price Convertible 3-in-1 Gym is really straightforward and can be done within a couple of minutes. Place play arch at desired play more by pressing the orange buttons at the base and tilting the arch until it clicks into position. Ensure you have also changed the switch on the top of the play arch to the mode you are using to ensure that the correct sound function will play. The Fisher-Price Convertible 3-in-1 Gym allows the play gym to grow and adapt as the baby develops. 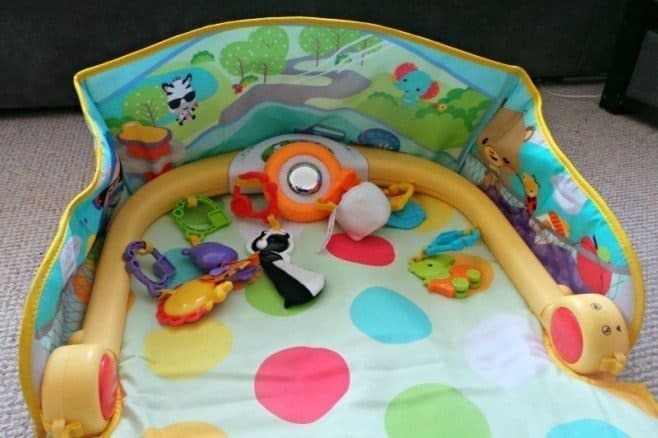 Starting in the lay and play mode baby is able to kick, wiggle, attempt to roll from side to side all whilst having an interactive arch above them with a number of different toys to reach out for, bash and create new noises with. Moving on to tummy time the Fisher-Price Convertible 3-in-1 Gym arch can be moved to the flat position enabling the baby to interact with the toys and light up the steering wheel. Helping them build up their muscle tone whilst exploring the world from a different angle. 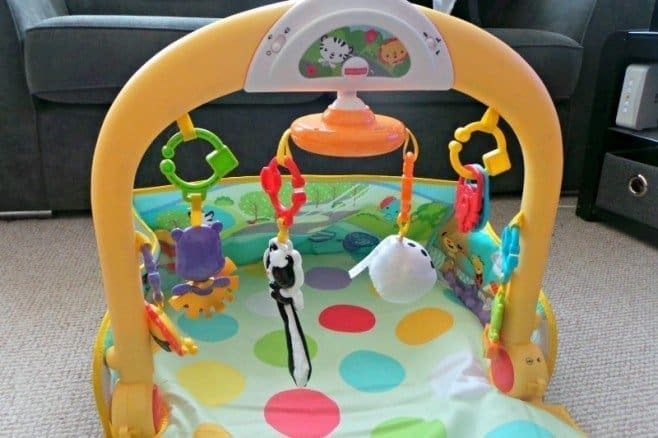 As the baby learns to sit unaided the Fisher-Price Convertible 3-in-1 Gym play arch is moved at an angle so that the toys and steering wheel are in the sit and drive mode. 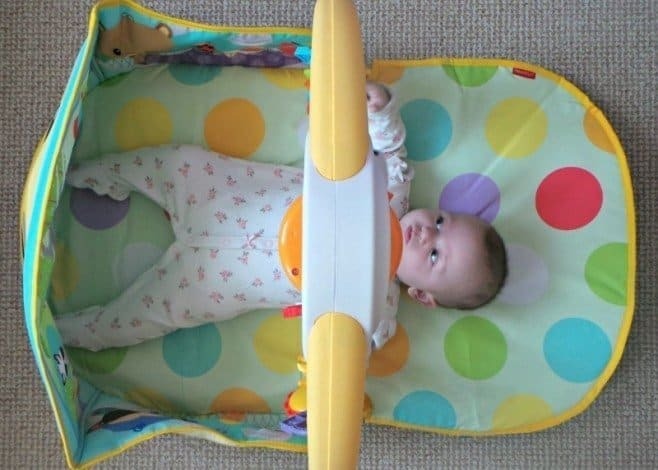 The baby is able to twist and turn the steering wheel to create sound and lights as well as having additional toys available to play with. Piglet is loving exploring the different toys, sounds and lights on the Fisher-Price Convertible 3-in-1 Gym. Swapping the toys around the different spaces available keeps play fresh, new and exciting. She is currently loving the lay and play position and is exploring the tummy time mode, however, she isn’t too keen on being on her tummy for too long at the moment but this is something that will come with time. The large activity mat is lightly padded so if you were to using on a laminate floor I would suggest popping an additional blanket underneath to add more padding for the baby’s head. It has space available for the baby to practice those all-important roll overs and wriggles. 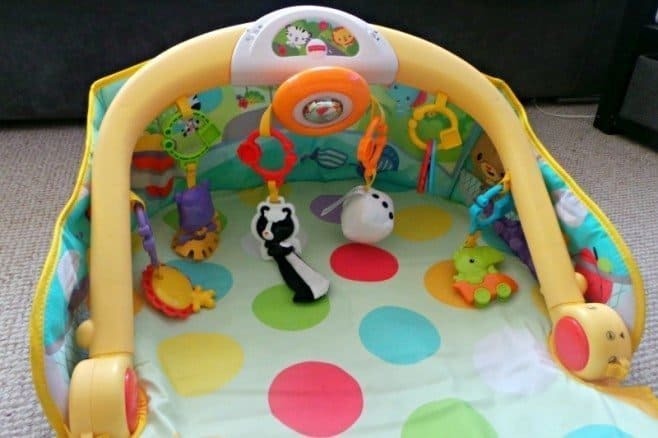 As a parent I love that the activity mat can be popped into was as you just know the minute you let the play is the minute they decide to be sick or dribble everywhere. I would have like to have had some support rods to be placed within the front of the car as it tends to sag a little which doesn’t affect play but just doesn’t look pleasing to the eye. The Fisher-Price Convertible 3-in-1 Gym is priced at £59.99 and is available from Amazon, Tesco, Argos and other leading toy retailers. Cute! I’ll have to refer this to my friend who will be having his first baby. Fisher-Price quality is REALLY hard to beat. Love their products!